The pyramid of Djedefre ("Ever Lasts Re"), one of Cheops's sons, is located 8 km / 5 mi. north-west of Giza on an elevated reef. Although he ruled for no more than eight years, his pyramid was completely constructed, according to excavating Egyptologist Valloggia. 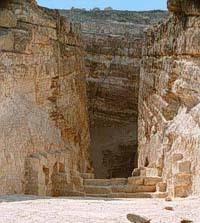 Originally, scholars believed that due to Djedefre's short governing period, his pyramid was not built in time and that only the subterranean facilities were finished. But after intensive analyses on the burial site of Djedefre, Valloggia claimed to be able to refute the prevailing opinion. Today, only a heap of stones are left of Djedefre's pyramid. He intended to achieve that his granite-faced pyramid, located on a distant bank high above the Nile river, would shine like a huge crystal in the setting sun.